posted: June 21, 2017, 10:25 a.m. | updated: June 25, 2017, 8 p.m. The Lord of the Rings is amongst the finest epics ever made - in both the book and film form. They have their own pleasures of different kinds. The bibliophile in me reverses the dense form of characters and narration that create a vastly enriched universe where everything happens in ways that rival mythologies. The film series, directed by Peter Jackson, bring this to the big screen in three films - The Fellowship of the Ring, The Two Towers, and The Return of the King. The films are long, and the extended editions even more longer. But they are so filled with lore and stunning visuals and characters that watching them for the umpteenth time is always a good time. With such gleeful passion for LotR, I was hopelessly disappointed to miss the marathon running at Lighthouse, a wonderful cinema, for the third year in a row. Tickets sold out fast, like really really fast. I even tried to go up to the theater in person this year, but to no avail. Then, I found out that they opened a second screening on the same day for popular demand. Awesome. I booked tickets as fast as I could. I go them. My first movie marathon on the big screen, extended edition LotR at that. Cool. I canceled all other events that weekend. Gary, a fellow PhD inmate (who also shares the productive procrastination gene) was game for it, and suggested we play a LotR drinking game. 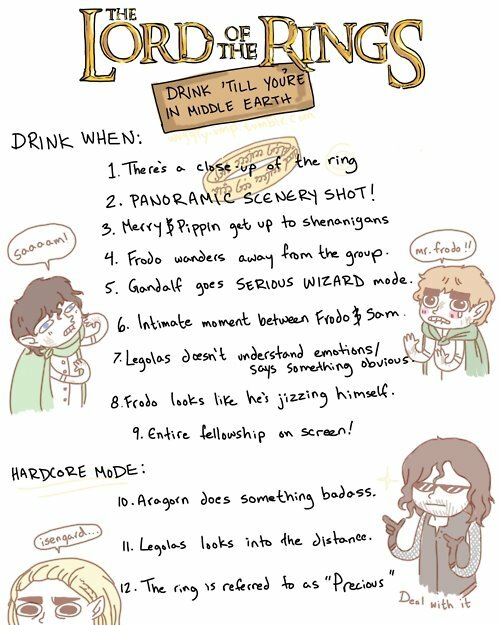 "We would drink ourselves to the glory of Middle Earth", I thought, "what a noble way to get inebriated!". To that end, Gary printed out a list of rules of drinking game found online. I'll list them here in case the image goes missing. The ring is referred to as "precious"
With that in mind, we started the marathon at about 1pm. It ran up to 1:30am the next day. And we were strapped to the seats for all but 90mins - time spent doing bathroom breaks, scavenging food, and refilling beers. When we inquired at the bar, we found that it would not be opening until 3pm, throwing some water over the plans. This was my first time seeing the Lord of the Rings on the big screen, and I loved every moment of it. Right from the first scene to the last, I was never bored for a moment. Though I remembered what happened in the next scene, it was still a visual treat. It was the same with every other person in the cinema - I never saw anyone being dismayed or acting annoyed. Everyone was looking at the screen all the way through. After the end of the first film, we agreed that it was good that we had not started the drinking game. The first film itself would have made us pretty drunk. We went for lunch at Jo' Burgers, which is an awesome place for burgers of all sorts, and is nearby. Due to my idiotic memory, we ended up being 15 minutes late as I totally fucked up the show times. We got beer and went in. Luckily, we found seats next to each other. We extended the drinking game to also include memes - any time one comes up on the screen, we drink. Lord of the Rings throws up some pretty memorable memes. The scene in the first one at the council, where Boromir/Sean Bean says "No one simply walks into Mordor" is one of the legendary memes. And everyone could see it coming as the scene started, and when he actually said that, people just laughed - unsure at first, but then giving in. It was fun. The movie ended quite late at night, and we felt the exhaustion of it as we tumbled out. I could have willingly watched another three, I thought as I walked out into the warm night. It was very enjoyable. Maybe they'll do a Star Wars marathon next.